Is this Melbourne's best savoury slice? Cafe Dorii is a tucked away little cake shop in Brentford Square which is on the Forest Hill/Vermont divide. It could be so easily overlooked. Yet Cafe Dorii is worth visiting for a particular slice that is very different than anything being served up in suburban bakeries. They call it a provincial slice and it has three scrumptious layers. The base is made from polenta and butter. And I am sorry for those who are trying to be gluten free but the base does contain a small amount of flour as well. But the polenta gives it a rich pumpkin colour. I'm not generally a polenta fan - a bit too bitsy. But this is finely ground so it makes a beautiful smooth pastry which is also delightfully crunchy and buttery. The next layer is a vivid green - wads of bright coloured spinach. Not overcooked so you can still see the shape of the succulent leaves. Then to top it off are bobs of cherry tomatoes wedged into a bubbling topping of three melted cheeses including some knobs of gourmet feta. Not only is this three tiered slice novel, but it is so delightfully colourful. A bakers's palette of orange, green, red and yellow. The cafe is little more than a hole in the wall but there is also some outside pavement seating as well which is lovely on a warm day. It is popular with locals and today when I was with a group of women celebrating a birthday. Given that they could have gone too far, more lavish surroundings is testament to the quality of the fare. As well as Cafe Dorii's 'calling-card' provincial tart there is a range of cakes and biscuits including neenish tarts and chocolate chip biscuits. Yet unlike other cake shops where everything is made to look uniform and perfect these all have slight imperfections. I like it. They look real. If you want standardised food go to the supermarket and buy mass produced. I only buy the coffee to go with the slice but it is is passable as outer suburban coffee goes. Am I a coffee snob? Yes. See my article on Balwyn's best coffee shops. And if anyone can tell me where Vermont's best coffee is please let me know. Another reason for visiting Cafe Dorrii is that almost next door is the Doncare Op Shop. This is a clean well laid out op shop with some surprisingly low prices and good quality goods. A complete outing. A provincial slice, a coffee and possibly a treasure from the op shop all for under $10. 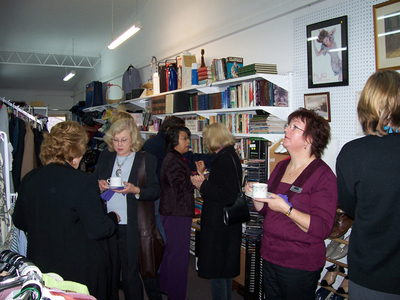 Opening of the Doncare Op Shop from the Doncare website.